When it comes to the use of technology in education, I often say that it is not a generational gap, but a learning gap that prevents our older generations from accepting new technology tools for learning. I think I may have to amend my position. There are a few things about mobile devices that point to a generational gap that may be preventing by some an acceptance of these devices as tools for learning. I am a true believer that we consider an item as technology if it was invented in our lifetime. Therefore, I consider a cellphone technology, but my car in some form or another has always been with me since the 60’s and to me that is my car and not technology. My younger daughter has had her own cellphone since Grammar school and full access to the Internet at home all of her life. She was Social Media involved as a toddler with Penguin World. She has always had a laptop, iPad and an iPod. We are fortunate enough and grateful to have afforded her those tools. She is now headed off to college with these experiences and tools in place. I often learn from her simply by observing how she uses things to learn. This weekend we were spending time at the beach house that is pretty much cut off from the world. My daughter was working on a final paper and asked if she could download a book she needed from Amazon. I gave her permission and watched her download it to her Smartphone as she continued working on her laptop. In consideration of my own ailments and frailties, I asked if she would not better be able to read the book if it were on her laptop instead of her smartphone? “No, this will be just fine,” was the answer. That is when I got it. I would struggle with reading a book from a Smartphone, but not so much a teen’s problem. Teens are reading text on their phones 24/7. They watch full-length movies and TV shows on their Smartphones. They do not need to make adjustments from previous habits. I had to adjust from Desktop use to laptop use as an adult. That is not a problem for kids who are multi-users when it comes to the devices of technology. The other big stumbling point when it comes to the acceptance of mobile devices used as tools for learning is the fact that the older generation perceives a cellphone as a phone, as the name would imply. Actually, the smartphone is a complex computer with phone capabilities in addition to thousands of other applications. Again, the youthful generation just uses the technology for communication, curation, entertainment, research, and photography without the oohs and aahs, while the older generation just marvels at all the bells and whistles of the new technology vicariously, through the experiences of others, often younger. While the older generation tries to figure out how to grant permission, while maintaining control over this new-fangled technology, the youth is employing it everywhere and all of the time, except in some cases in school. Adults are delusional to think that they have the power to control this technology. If schools need to control Smartphone use, let them figure out ways to incorporate them interactively into lessons. Teaching kids responsible use is the best form of control. It is lifelong skill. Mobile devices provide a gateway to more relevant content than could ever be placed in a textbook. Why are we not preparing our kids with the skills to access, assess and utilize that content? Will they not need these skills in the technology-driven world in which they will live? They come to us trusting that we will be preparing them with what they need to thrive in their world in the future, but many of our educators are not even in the world of today. I have said this before. If we are going to educate our children for what they will need, we must educate our educators first. Technology is changing things too fast for us all to keep up without a little help from others. There is so much to know, that we have reached a point where many of us do not know what it is that we do not know. Whether this roadblock to technology use in education is a learning thing or a generational thing, collaboration may be the map to the way out. Educators need to connect and collaborate in all of the methods we have available to us in order to learn and share. I think I have always been a connected educator even before “Al Gore invented the internets”. I received journals in the mail, signed up for numerous workshops, attended any and all conferences I could get sent to, continually joined school committees, and I taught many in-service courses. With that type of exposure, I developed a fairly evident footprint in my school and district. People knew who I was, and what my educational philosophy was because I lived it. Of course looking back to my 20th Century career with a 21st Century eye, there are many things I did then that I would never do today. The idea of an educator’s digital footprint is a far more than just a reaching reputation. If one is to have any involvement online, that involvement better be positive and constructive, for it is there for eternity and for all to see. If one has amassed a number of good positives in one’s digital impression, it is not usually offset by the occasional misstep that we are all prone to have from time to time. In regard to the recent “Jeff Bliss” viral video, I felt bad at first for the teacher in the class at Duncanville High School. Too many people were out to demonize her without knowing who she was, or if this packet curriculum she handed out was her personal style, or a mandated, packaged, paid-for curriculum of the school district. She had no digital footprint to go to. I looked, and I could not find one. I am fortunate to work for SmartBrief as a contributing editor. I am sent to many education conferences in order to promote my connections with educators. Even before this however, I found the digital connections made through Twitter, LinkedIn, and Facebook were, for those people I wanted to get to know, more than introductions to people. They were the beginnings of relationships. Most of the people in education, that I call on as friends today, began as digital connections. Technology has helped me expand and deepen professional relationships to a degree never before possible. As a regular teacher I was now able to connect, and interact with authors and experts as an equal in discussions on education. These digital relationships were further expanded with face-to-face contacts at education conferences. Since the interactions were digital, they took many forms on several places: groups, discussions, comments, and interviews, and my footprint grew. As I ventured out to write a Blog my educational philosophy took on a life of its own. People could now read my thoughts and views, as well as my personal beliefs, likes, and dislikes. All of this has fit into my lifestyle. I love the connectedness, I thrive on the interaction, and I live for talking about where we are going, as well as, where we should be in education. All of this, and age, has morphed me from an educator of kids to hopefully a wiser educator of educators. It has always been about the connectedness. This year I was fortunate to attend the MACUL conference in Detroit. That is a statewide education conference for Michigan educators. MACUL is an ISTE affiliate. 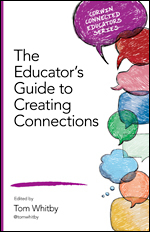 My connectedness led me to friendships with many of the featured and keynote speakers; Steve Dembo, Adam Bellow, Nick Provenzano, Kevin Honeycutt, Erin Klein and Gwyneth Jones to mention only a few. It was a great lineup of educators at The Cabo Center in Detroit. Driver: Sure. Are you a teacher? Me: Why yes I am! There are thousands of us swarming Detroit, have you had many teacher customers? Driver: My last customer was a teacher. He lives in New York and has been teaching for over 40 years! Me: Did he have a mustache? Me: A nice full manly one…not a wimpy pencil ‘stache. Driver: Ha Ha! Yes he did. Driver: Yep. that’s him!! He was a very nice man, I could tell he is a man of principle…I saw him walking out and another cab driver tried to lure him in. He refused, kept walking and continued to my cab at the front of the line. He is a very nice man! Me: Great to hear! I’ll be sure to tell him you said hello. Driver: Ah yes, please do! Lessons learned: It’s a small world. Twitter is cool. Always do the right thing; you may never know the impact has on others. I am proud of my digital footprint. I am happy to be recognized for as much what I am as who I am. In addition to educators maintaining connections and providing a positive footprint, we need to also stress this with our students. There may come a time when your digital footprint will be your accomplishments for portfolio. Interviews may be have less of an impact on job procurement. It may also go a long way in maintaining a position. Of course that brings us back to our teacher on the viral video. Given the information on hand and their digital footprints, who looks better, the teacher, or the student? What impact will that video, and all that follows from it, have on each of their lives? YES, Technology and Social Media are important in our culture. It cannot be effectively and responsibly self-taught. After watching the Jeff Bliss’s, viral video, as well as the remix of it, created to popularize the event even more, I was almost moved to do a reflective post on the subject. After viewing a number of supportive blog posts for the Bliss position I kind of backed off thinking that I was off base in my position. Then I read Why the Jeff Bliss story makes me want to quit by a fellow English teacher. The end of the academic year has all teachers stressed out. After giving one’s all for a year, and having it come to an end, hoping all along for the success of the students, leads one to question much of what had been done during the year, and even why it was done. When I first saw the Bliss video, I saw a kid being asked to leave the class for whatever the reason, and the kid trying to get back at the teacher. The kid began to use an attack that echoed the focus of many educators seeking to reform the system with the same rhetoric. Without knowing anything of the student, I determined he must be active on social media and had an interest in what was being said about the change in education. This was some evidence of intelligence. I also felt that everyone would see this teacher as the “devil teacher” responsible for all the ills of our system. There is probably some accuracy to both of those descriptions but I think neither is a reflection of the whole truth in this situation. As a retired teacher I encountered many rants from students that I removed from class for disruptive behavior. What is different in this instance is the addition of social media and the educator’s perceived opposition of the position taken by the student. This was further advanced by the teacher’s negative responses to the student’s critique. All of this recorded and published to the world in You Tube Celebrity. I was moved by the frustrations of the blogger who feels overwhelmed with the ongoing blogging, reflection, and discussion in social media about all of the turmoil in education. Much of this is flamed by the mindless, senseless and poorly planned reforms put forth by non-educators. I am not arrogant enough to think only educators can intelligently reform education, but the general feeling among educators is that the reforms are being mandated with very little educator input. That is the most frustrating part to many educators who are being targeted and maligned even by fellow educators. Educators seem to be circling the wagons and shooting to the inside. Most educators are doing what they have been trained to do, or what is supported by their school’s culture. I hate the fact that so many teachers use the work packets to present material, but that again is what is supported by the system that they must work in. We need to improve our professional development and be open to more relevant teaching methods, employing more relevant tools for learning, as well as more relevant attitudes toward student-centric learning. My friend and colleague Lisa Nielsen is a great student advocate and passionate education reformer. We have collaborated on a few very popular blog posts. I do not fault her for taking the side of Jeff Bliss in his rant against his teacher. Bliss made a convincing, and passionate speech against an outmoded method of teaching that stymies our system of education every day. I hope Lisa continues to follow her bliss (not the student) in supporting students in education reform. I would only hope that an “us and them” mentality does not dominate the discussion of education. There is no group more in favor of positive education reform than educators. We must keep in mind that educators are also products of the same education system that we seek to reform. They should not be the targets for the reform; they are in fact victims of that system as well. In order to educate our students, we need to first better educate our educators, and continue to educate them as part of their job. 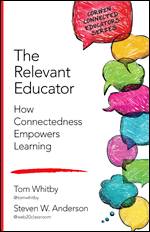 To be relevant educators, we need to be relevantly educated. That implies continuous education in a computer-driven, continuously developing culture. I would hope that this blogger was not discouraged by the reflection and conversation going on about education reform. We need more educators involved in the discussion that has been hijacked by business profiteers and politicians. There is a planned assault on public education. We need more educators adding their voices to the needed change. We need educators to tell other educators that it is okay to give up methods of the past, that are not working in today’s system of education. It is a question of permission, as opposed to confrontation. Educators are all in favor of kids succeeding; it is but a question of how to accomplish that goal. I would encourage this blogger to hang in and continue to speak out. If the post by this English teacher moved me, others may be moved as well. That is a skill that is not mastered by many and it is a powerful tool for change. We need more educators stepping up and speaking out if we as educators are to take back the discussion that we left to other less qualified people to dominate. Each Sunday afternoon there are five Topic questions posted on a poll to determine which will be selected as that week’s #Edchat Topic. There are two #Edchat discussions each Tuesday on Twitter, so the top two topics selected by the poll become the topics of the chats. The number two choice goes at noon, Eastern Time, and the number one selection goes at 7 PM, Eastern Time. The larger audience is the 7 PM Chat. If you did not know it before, I am the person responsible for making up the #Edchat Topic questions that are voted on each week. I admit that I do have favorites each week, but, more often than not, they are not the favorites of the voting public. This week it was a little different. I actually had two favorites, and fortunately for me, they were the chosen topics for the chats. I found both yesterday’s #Edchat discussions thought-provoking, and very much in need of public discussion. The topics were very much connected as well. 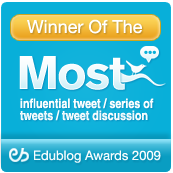 #Edchat is very much an open, public discussion by educators from around the world. Ideas on each topic are presented from various points of view as we discuss the varied topics in education each week. As in any public discussion, a person may pick and choose those ideas that suit his/her needs and in this case, educational philosophy. Sometimes it is a new idea, and other times it is validation of what is already being done. Since it is a discussion using Twitter as the platform, most of the participants are educators who are somewhat familiar with technology and social media. As a generalization they tend to be a collaborative group, more progressive in their approach to education, and open to the use of technology as a tool for learning. The other day I engaged an educator who described himself as a 20th century traditionalist educator (my words). He said that he participated in #Edchat so that he could know his “Enemy”. When I called him on this, he informed me that “Enemy” was in quotes in his tweet. I guess that was to make it humorous, but there is much truth in humor. The point here is that most of the participants are striving to move from the methods and pedagogy of 20th century education to a place that we have not yet found. It is also a great help when authors and experts on these various topics join in on the Chats giving clarity and direction in their areas of expertise. Many of these thought leaders are connected educators. Usually the #Edchat question is a singular interrogative. The Topics this week had more than one part in the hope of generating more discussion. The noon Chat Topic: What is the BIG Shift in education that everyone is looking for? Is there one big idea that can positively affect education? If not why? Of course there is no single idea because education is too complex for an easy fix. A point lost to most politicians and business people. The question, I thought, would prompt the chatters to present and promote their best and biggest idea. From the folks I engaged in conversation on this topic the overwhelming objective was support of student-centric as opposed to teacher-centric lessons. The shift being from Direct instruction, and lecture to problem-based, or project-based learning. The teacher would no longer be the content-delivery expert filling the empty vessels of students, but rather a mentor, guiding their learning direction rather than mandating it. The 7 PM Question: Children are anxious learners in the early grades of education. What are the factors that turn kids off to learning, as they get older? This #Edchat started slowly. I hate when that happens. My biggest fear in doing these chats is that there may come a time when nobody responds to the question. Going into moderator mode, I broke the topic down, and peppered the chatters with a series of smaller questions to loosen them up. That worked which immediately calmed me down. It was like the priming of an old well. It took a minute to get it going, but it came on strong. Words that popped up with those who I engaged were curiosity, authenticity, and ownership. What I took from it was that students at a young age are curious about learning because it is all new and exciting. It is also relevant ant authentic since what kids are learning enables them to participate in more stuff as well as society. However, some reach a point where they think they have as much as they need and the curiosity is gone. The direction however continues providing to them things that they no longer want to engage in. They do not own their learning and cannot direct its direction to things they would like to learn. If this occurs in a student, it comes at different times for each student. Some teachers saw it on the elementary level others in Middle school where hormones play an even bigger role. The point here is that it happens to many students. Engagement in learning is the goal of education and the ability for students to own that learning and for it to be authentic, and relevant was a theme for this #Edchat. Again it came down to the teacher being the guide or mentor and not a content delivery person directing content to kids who don’t see it as relevant or authentic. They prefer to create content instead of memorizing it. They prefer to use content instead of regurgitating it on a test. Both of these #Edchats led me to the same place. For kids to be engaged in learning it will be more effective if they own it and direct it. Teachers can always guide the direction and, as content experts, they have the capacity to do so. Teaching kids how to learn, and how to continue to learn, is more important than whatever content the curriculum tells us the students should know for a test. If we can use their interest to promote our content, fine. If our content doesn’t interest students at all, then what do we do? #Edchat is not the best method to introduce people to online chats for the first time without preparation. It requires some knowledge and a little strategy. If you are interested, this may help: #Edchat Revisited. 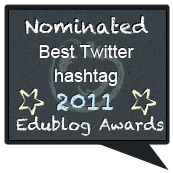 If you are interested in viewing the past #Edchat discussions, we have archived the last several years here: #Edchat Archives. 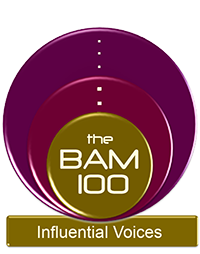 If you do not have time to read, you can download a podcast analysis of several of the #Edchats from Bam Radio Network, and The #Edchat Radio Show. #Edchat is one of many education chats. 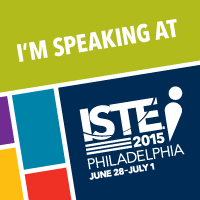 It was started 4 years ago be Shelly Terrell,@shellterrell, Steve Anderson, @web20classroom, and me,@tomwhitby. It was not the first chat, but it is the most enduring, and it has spawned many, many others. Over this last year I have been fortunate to have been sent to many education conferences on behalf of SmartBrief in pursuit of content and guest bloggers for SmartBlog on Education. 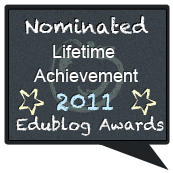 It is a dream job for a retired educator and an education blogger. 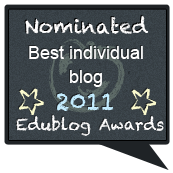 The intent is to always keep the educator’s voice on SmartBlog authentic and relevant. In that capacity, I have attended and conducted a multitude of workshops on various education topics. Since I am no longer in the classroom, and have no need to apply what I learn about current teaching methods in a classroom setting, I often attend these workshops as an observer, or even a critical observer in some cases. In conference after conference, and workshop after workshop I have observed successes and failures in the methods employed by presenters to get their material across to their audiences. Of course my biggest criticism is that too many presenters view the people in the room as audiences, and themselves as some sort of entertainer. Of course a successful presenter is part entertainer, as is any teacher, but more importantly, he or she is there at a conference workshop to educate educators and that is a primary goal. For that goal to be met presenters might be better served thinking of the people in the room as learners, and employ their best skills as an educator. In fairness to most presenters, the best do just that. Much can be learned as an educator by watching what works with a bunch of teacher/learners. Of course there are some who would argue that these are adult learners and shouldn’t be compared to kids. I used to think that as well, but I am not as sure, after all that I have observed. I found one of the best explanations of adult learning in this article: “Adult Learning Theory and Principles” from The Clinical Educator’s Resource Kit. According to the article Malcolm Knowles an American practitioner and theorist of adult education, defined andragogy as “the art and science of helping adults learn”. After considering these principles and observing many of them first hand at these professional conferences, I started to wonder if the reason why these same principles do not apply to kids, at least on the secondary level, is because we prohibit them from happening in our education system. Do we limit our students learning by blocking access to the very things that motivate us as adults to learn? Can Students be self-motivated and self-directed? As adults some might say we are “pursuing our bliss” therefore, we are self-motivated and self-directed. Are our students bereft of bliss, or are we blocking out their bliss? At the more successful conferences providing adult learning environments I have observed many things that aided the learning of adults. The best conferences provided Internet access for all. This enabled adults to use varied and sundry laptops and mobile devices. I still revel at the memory of a room full of learners listening to Chris Lehmann at the Educon Conference as he placed notes on a white board. When he was finished with his illustrated point in the conversation, 40 adults stood up and took a picture of the whiteboard with their mobile devices (mostly cellphones) for later reference. Student classrooms might have over 40 students in them but how many are allowed to take pictures of the teachers’ notes? Of course the resounding positive comments from any of these learning environments is that there is a love of the conversation, as opposed to the lecture. 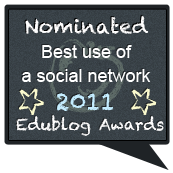 That is common at Educon and it is the mainstay of the most successful Edcamps. Of course that conversation method is not the focus of teaching kids. Most educators focus on direct instruction and lecture as the mainstay for their lessons. Then there is the cry from a multitude of adult conference learners that they hold teacher-presenters in the highest regard, because they are authentic. They have been in the classroom, and have paid their dues, so to speak. When real classroom teachers talk about education, it is relevant and real. This is a common sentiment among adult conference learners. I guess that relevance is important to the adult learner. When it comes to the kid learners are they even given a smattering of relevance or are we steeped in curriculum some of which may have been around since the mid 1900’s? Of course the biggest outcry from adult learners at conferences comes when they are subjected to PowerPoint presentations that are text-ladened and read to the learners word for word by the presenter. This is the most egregious of mistakes and often the initiator of an exodus by the adult learners from the room. What alternative do kid learners have given the same set of circumstances? Maybe as adult learners we need to take a look in the mirror before we resume our role as teachers for kids. In the final analysis, I do not think that there are differences in the way we learn as adults, or kids, but rather the differences lie in the opportunities afforded to learn. If we respected kids more as learners, they might be more self-directed and motivated in their learning. If they are allowed to participate in their learning, they might take more ownership. What learner wants to own something that is not in his, or her interest to own? If we can understand better how we learn best, maybe we can alter how we teach to be the best.